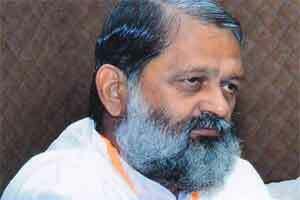 Chandigarh: Haryana Health Minister Anil Vij said that the Pneumococcal Conjugate Vaccine would keep children safe from pneumonia and ANMOL – ANM Online Application would keep all their data online. The Minister spoke after launching Pneumococcal Conjugate Vaccine and ANMOL ANM Online Application for the good health of children in the state. As many as 2,735 ANMs of nine districts have been distributed this ANMOL tablet, in the first phase. Mr Vij said, “Every year, 40,000 children suffer from Pneumonia and this vaccine would prove beneficial for them. The market cost of this vaccine, which is given up to the age of nine months in three doses, is Rs 12,000, but this vaccine would be given free of cost to children in all government hospitals.”ANMOL is an online system through which ANMs of the state are being digitalised for the first time. For this, doctors, officers of the Health Department and ANMs have also been imparted training.” He said that in the first phase, ANMOL tablets has been distributed to 2,735 ANMs of Ambala, Gurugram, Hisar, Jind, Kaithal, Karnal, Palwal, Sirsa and Mahendragarh districts. The facility would soon be provided in the remaining districts. With the help of the tablet, ANMs would be able to upload the complete record of pregnant women and immunization record of children on RCH portal, which would also ensure updation of this from time to time. “The state government would soon provide Smartphone to all ASHA workers to keep all activities of the department online. In order to provide people with excellent healthcare, 400 Wellness Centres would be opened and in the first phase, 200 Wellness Centres would be completed. Apart from this, Cath Lab facility is also being given in four districts of the state and facility of Dialysis and MRI, CT-Scan is also being provided in about 12 hospitals. “It is for the first time, 100-bedded Mother and Child Health Care centre would be opened in Panchkula, Panipat and Hisar districts. Each centre would be constructed at the cost of about Rs 20 crore. Apart from this, the DNB course has been started to overcome the shortage of doctors in the state,” the Minister said. He said that a proposal is under consideration to make it mandatory for doctors, who are doing MBBS from government medical colleges, to serve in government hospitals of the state for minimum one year. 40000 x 12000,= 480000000 CRORES For VACCINE alone + 200000000 , OTHER experiences comes to 500000000 CRORES. Only for single vaccination means more than fifty percent of HEALTH CARE budget is spent on uncertainty. Please correct me if I am wrong , don\’t forget to thank me if I am right. 20 CRORES FOR 100 BADED HOSPITAL QUITE NICE AND SEEMS TO BE COST-EFFECTIVE. I HEARD 120 CRORES BEING SPENT FOR A 400 BADED HOSPITAL , THAT MEANS FOR THE SAME AMOUNT OF MONEY 600 BADES CAN BE CREATED. I HOPE THE QUALITY OF THE CONSTRATION IS NOT COMPROMISED , UNLIKE THE 120 CRORES BUILDING STARTED LEAKING BEFORE IT IS PUT INTO PROPER / FULLY USEFUL. COMING TO VACCINES WHETHER IT IS 120 RUPPEES OR 12000 IS NOT GOING TO BE USEFUL UNLESS BODY IS STRONG ENOUGH TO PRODUCE IT\’S OWN ANTIBODIES. HEALTHY MOTHER HEALTHY CHILD , OPPOSITE IS ALSO TRUE SICK MOTHER , SICK CHILD. GIVING ATMOST IMPORTANCE MATERIAL HEALTH , CLEANLINESS HYGIENE AND DIET, NUTRITION SHOULD BE PRIORITY . FAMILY PLANNING, BIRTH CONTROL, SPACING TO BE PRIORITISED. I HAVE FELLING THE PHARMA COMPANIES ARE TAKING THE MINISTRY FOR A RIDE, BY FALSE PROPOGANDA.